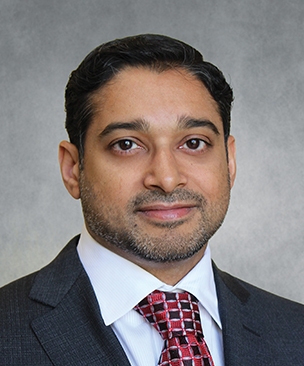 After receiving his medical degree at the Medical College of Virginia, Dr. Nambiar served an internship at Stony Brook University and completed his training in radiation oncology at the Henry Ford Health System in Detroit, Michigan. He has also completed a interstitial brachytherapy course at the Seattle Prostate Institute. He is Board Certified in Radiation Oncology by the American Board of Radiology. Dr. Nambiar has expertise in both intracranial and extracranial Stereotactic Radiosurgery (SRS) and Fractionated Stereotactic Body Radiotherapy (FSRT), with an extensive history treating sites within the brain, spinal cord vertebral bodies, as well as the lung, liver, pancreas, and the adrenal glands. He has participated in clinical trials including in the use of partial breast irradiation in the treatment of breast cancer, utilizing both intraoperative and post-operative modalities. His other areas of interest include head and neck cancers and gynecologic malignancies. In addition to his clinical roles, he has substantial interest in computer information systems and health informatics, playing an important role in developing the “paperless” environment at his previous place of employment.